Around Christmas, my long time grocery store (Dominick's) closed, along with all the others in Illinois. This has been a slight inconvienence as it is a greater distance to the next store. However, it was a good catalyst to get me to shop at a smaller and better store, rather than be lazy and just go to the closest place. So I've set up a good system where I can take my normal Metra train home from work but go past my stop to the next one, which takes me right to my new store. Then I have about 25 minutes to shop and I can catch a bus straight back west on Grand Ave and get dropped off right in front of my place. I've been using this system to good results for weeks now and a few trips ago, I noticed a thrift store across the street as I walked to my bus stop. They were closed with a sign in the door saying that they were off picking up some goods from a seller. I made a mental note to return -- and today I did! I remembered just as I was crossing the street and alas, they were open. Both of the owners David and Kelly were sitting inside with their little dog who is apparently also the mascot of the store. I tried to see inside if they had records and I could see the stack even through the window. I entered and after a short greeting got back there and got down to work. 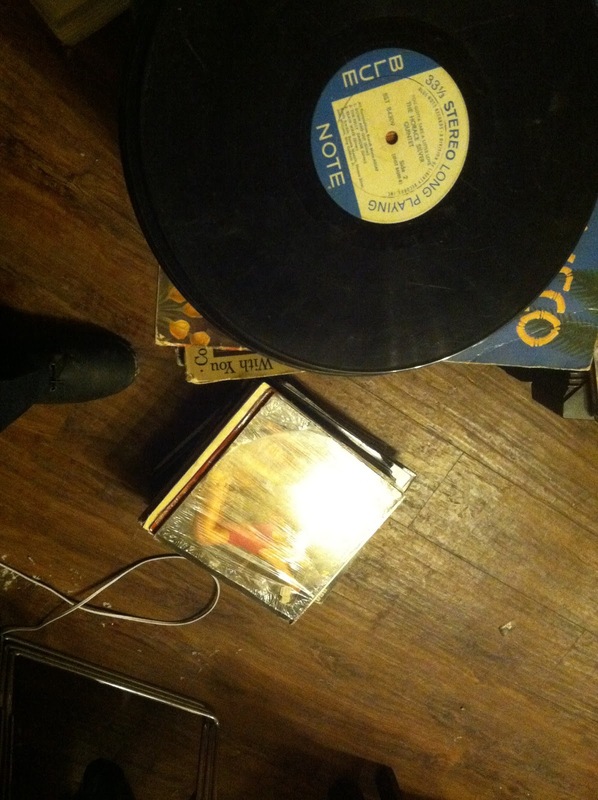 There were probably 20 records in a stack, with another stack of 7"s on top without sleeves. Now I knew I had about 10 minutes max before I had to get the hell out of there or I'd miss my bus. I set the 7"s aside and start digging through the pile of LPs. I came across this gem right away! what a shame! look at this beat copy of a blue note classic! 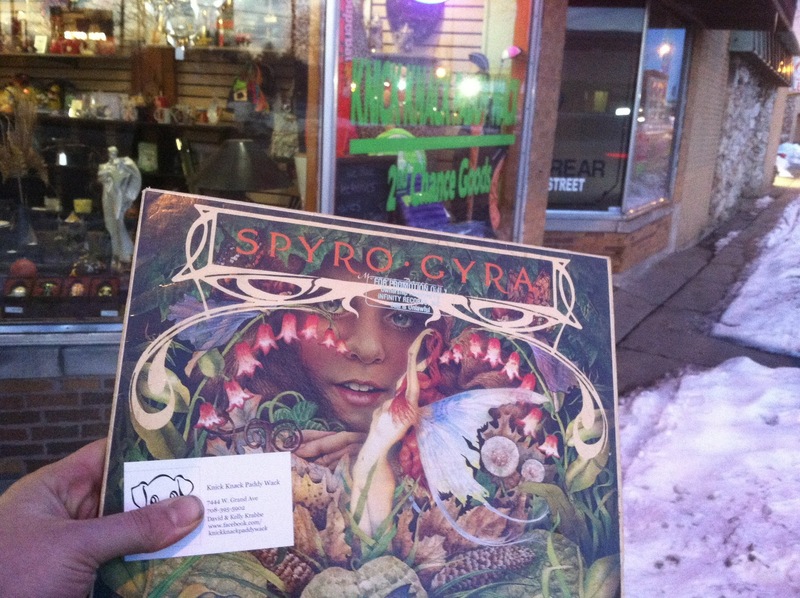 I've had a shot at some Spyro Gyra albums before but always passed them up. I must be a total poseur because I would have bought them if it was this album (as everyone knows the title cut) but I always came across other albums. I almost laughed out loud when I saw this today and realized what I had. It is complete with the original paper sleeve and its even stamped 'FOR PROMOTIONAL USE ONLY' by the record label on the front. Over the weekend, I took the train out to my parents house and I gave my brother $40 for the huge dinner we cooked (he spent about $80) so I was left with nothing. But I realized that on Sunday as I went to leave so I got $2 back for my train fare. However, the conductor didn't notice me so I rode for free. Good thing - because only had that $2 on me and there would not have been time to hit an ATM (and I assume they would not have accepted credit). The record bin was marked $3 but I gave them my (abbreviated) hard luck story and they accepted my $2. They told me they expect to have some more vinyl in about a week and gave me a business card and even wrote an additional number on the back to call and check to see when the shipment has arrived. They also said that Monday and Tuesday are their days to be on the road doing pickups so I was lucky to have caught them there today. Side 1 is kind of tore up - its pretty skippy even though it looks great. Side B played just fine though and I am pleasantly surprised to hear their overall style besides the one song I knew, it's good stuff! Great story. excellent find. thriftstores are the best. you never know what you might find. I can picture that couple and their dog. Would love to check it out.